Harvest Monday is here again. I managed to get out to the garden between showers to harvest a few things this week. 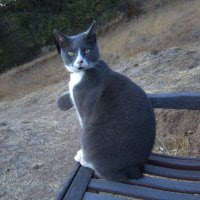 There isn't a super abundance of anything, well, there's really no abundance at all right now, but I'm not really complaining because I'm happy there's something at all. 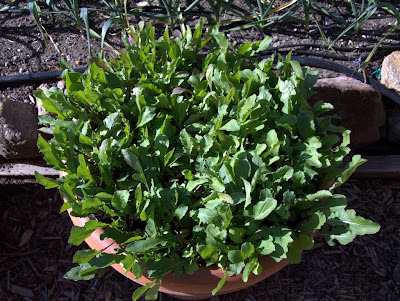 I picked enough variety of tender greens to make a nice salad. 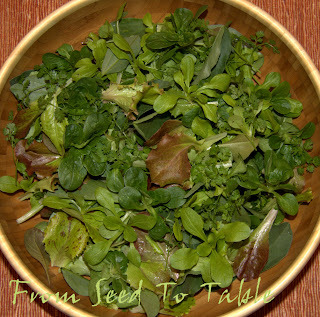 The bowl contains mixed baby lettuces, Golden Corn Salad, Vit Mache, tender young fava leaves, and sprigs of chervil. I got just enough Olive Leaf Rapini and Golden Chard to make a nice saute for two. And a bunch of cutting celery that went into soup with tomatoes that I canned last September. Golden Chard - 6.25 oz. Olive Leaf Rapini - 7.5 oz. Cutting Celery - 4.25 oz. Golden Corn Salad - .5 oz. 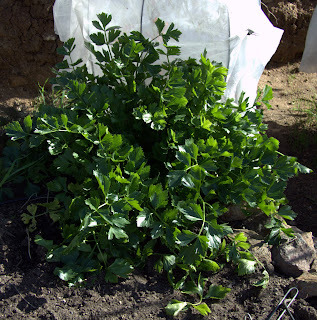 Fava leaves - .5 oz. Vit Mache - 1.5 oz. 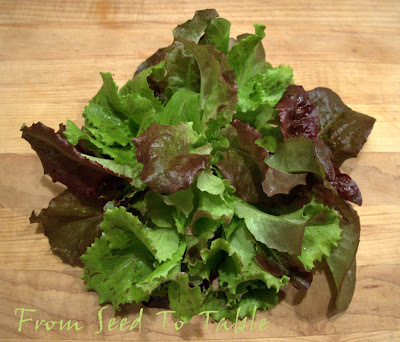 Cutting lettuces - 1.75 oz. I also picked some garlic shoots that were sprouting from some garlic that was accidentally left in the ground last year. I didn't think to weigh it, next time I will, there's a few other orphans sprouting out there as well. Get on over to Daphne's Dandelions if you would like to see what other garden bloggers have harvested lately, it's inspiring! Ghost image because I had to shoot through the window. 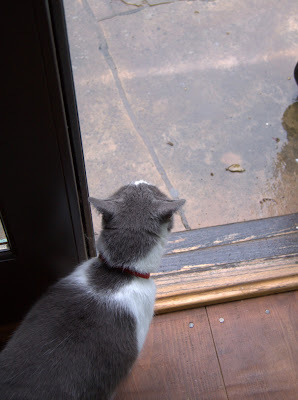 Jake wants to know when it's going to stop. 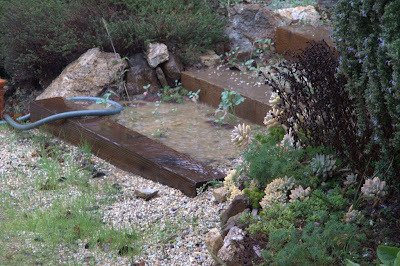 The fountain was empty on Saturday. One of the views from my desk. Do you think that the weeds might drown before I get to them? That's not fog, nor mist, nor clouds obscuring the view across the valley. 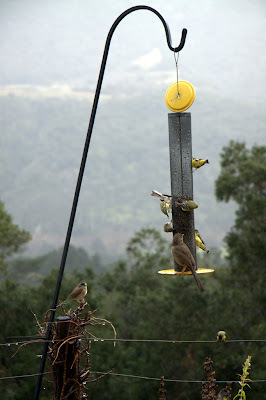 Look what the wind did to the finch feeder. But look! 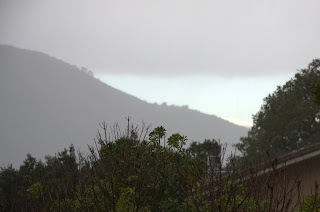 That's blue sky over there! 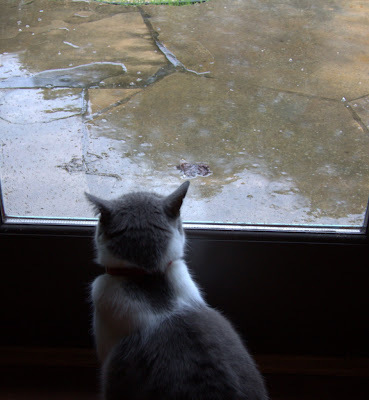 Yeah Jake, it's nearly stopped raining. 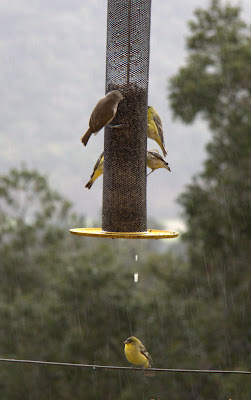 The finches are coming out of hiding. And a few of their friends. You can even see the other side of the valley again. 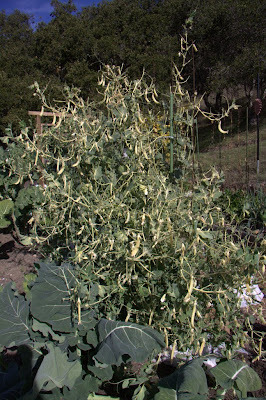 The wind was not kind to the kale. It got the peas the other day. I cut them down to a couple of feet. The chickens got a treat. 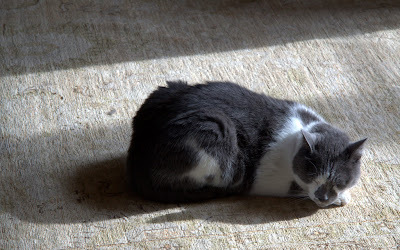 Jake found a perfect spot to enjoy a moment of late afternoon sun. 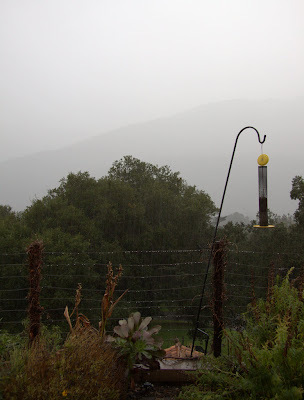 It's still slow in the garden now so there's not much to show for Harvest Monday. 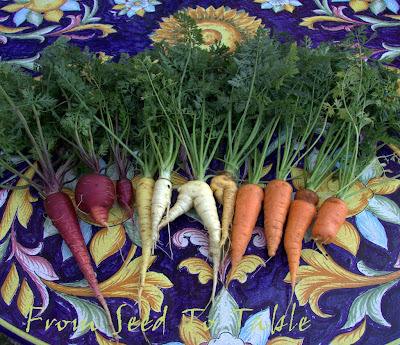 There's the carrot harvest shown above, from left to right Afghani Purple, Dhagestan White (some are yellowish), and Early Scarlet Horn. 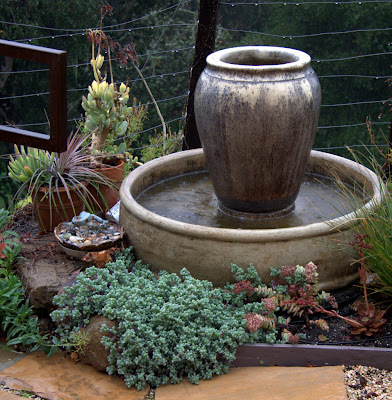 A few of them are rather good looking, and the rest are, well, only a gardener could love the look of them! All have been equally delicious. A few of them were used in open faced sandwiches of toasted country bread generously spread with hummus topped with grated carrot drizzled with a bit of good olive oil and sprinkled with roasted salted sunflower seeds. Some more went into a vegetable soup with extra chickpeas from the hummus. And a few are left in the fridge. The chickens got the tops. I've been weighing the carrots without the tops, I wonder if I should include those in the harvest also? Afghani Purple carrots - 7 oz. Early Scarlet Horn carrots - 9 oz. Daghestan White carrots - 6.25 oz. Olive Leaf Rapini (trimmed) - 7.25 oz. Cutting Celery - 2.75 oz. 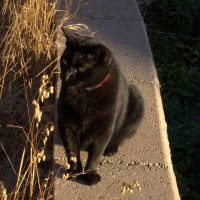 Our host for Harvest Mondays is Daphne, please visit her blog Daphne's Dandelions to see what other garden bloggers have been harvesting. Perhaps you'll join in and show us what you've been harvesting as well! Harvest Monday is here again. The pickings are getting more slim as winter progresses, the veggies just don't grow as fast. 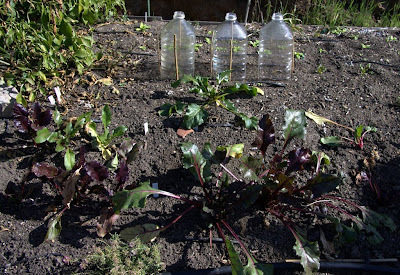 I thinned the Vit mache and plucked out a bunch of Golden Corn Salad that is volunteering under my garden bench. Here's the two varieties mixed together. The mache and cornsalad accompanied some roasted Chioggia beets and orange segments for a nice salad. We also had some baked goat cheese that was coated with an almond and bread crumb crust. 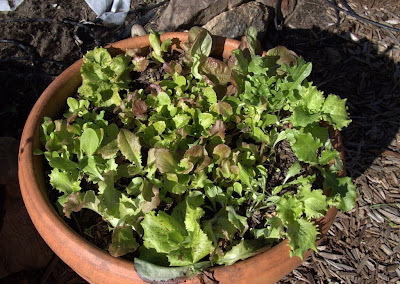 And I thinned my pot of mixed lettuces. 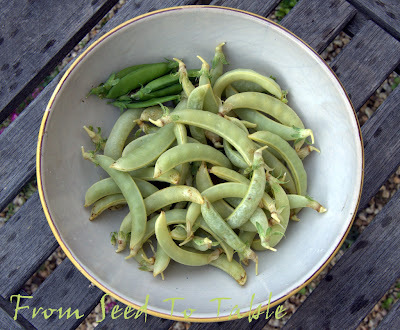 And here's one more harvest of Opal Creek Golden Snap Peas and a few Kefe Beinwil snow peas. 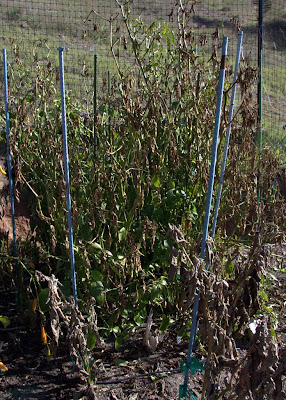 Some of the snap peas showed damage from the frosts and freezes we experienced a few weeks ago. The undamaged peas were sweeter. Piracicaba Broccoli shoots - 4.5 oz. 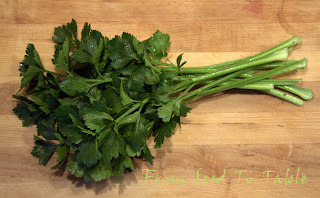 Cutting Celery - 1.5 oz. Golden Corn Salad - .75 oz. Vit Mache - 1 oz. Opal Creek Golden Snap Peas - 9.5 oz. 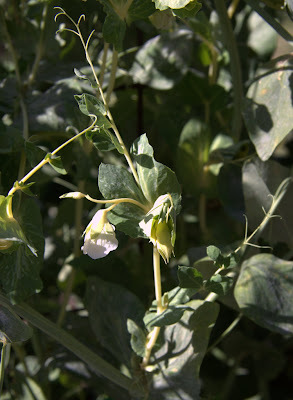 Kefe Beinwil Snow Peas - .5 oz. 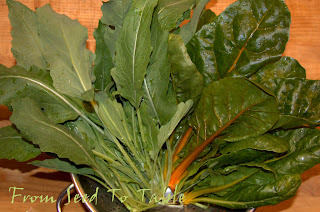 Head on over to Daphne's Dandelions so see what other garden bloggers have harvested lately. I've been experimenting with the breadstick recipes in Carol Field's book The Italian Baker. What first put the idea in my head to bake some breadsticks was dinner at Incanto in San Francisco. 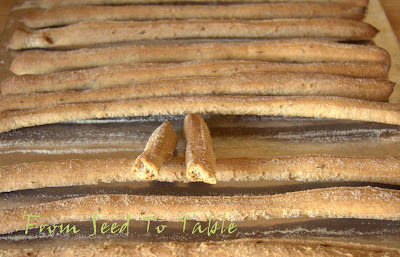 They had some wonderful fennel flecked breadsticks on the table and I could hardly stop munching (crunching?) them. At that time I was harvesting lots of aromatic seeds from my Red Florence Fennel so I was determined to make my own version. Fast forward a few weeks, post-holiday madness, I'm finally crunching some of my own. What I liked about the Incanto sticks is that they were light, crunchy, and very flavorful. I've given up on buying breadsticks, more often than not they have no flavor or they are doughy and heavy. 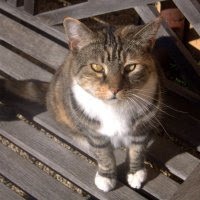 Although, there is one vendor at the farmer's market that has good breadsticks, but they are so expensive. Anyway, I've never seen fennel flavored breadsticks anywhere but the restaurant and that's too far for me to go to get a regular fix. So, out came my trusty old favorite book about Italian baking. I can't believe that the book was first published nearly 25 years ago, and my copy is nearly that old and starting to look like it. I've used many of the recipes in the book and this isn't my first time making the breadsticks. There isn't actually a version that uses fennel seeds, but most of the recipes use almost the exact same proportions of water, flour, yeast, oil, and salt, the main variations being in the flavorings. All I had to do was figure out how much fennel seed to use. The first attempt was not my best. Actually, it had everything I wanted in a good breadstick except I used far to much fennel. The aroma was fabulous, good crunch, first bite tasted good, and then the fennel flavor became overwhelming, it actually seemed to have a bit of a numbing effect on the tongue. Darn. For my second attempt, I tried a different flavor, fresh sage. I pretty much followed the recipe for the sage breadsticks except I substituted whole wheat flour for 20% of the white flour. Ah, now those were good! Fabulous when wrapped with some prosciutto. Today, for my third attempt, I went back to fennel. This time I used a lot less and I also substituted spelt flour for some of the white flour. They smell wonderful, not so strongly fennel scented as the first time, I like this batch, just enough fennel. And I do like the addition of the spelt flour, although it does make the breadsticks a bit less light. Heat the water a bit warmer than the yeast would like and stir the malt syrup into it until the syrup dissolves, this takes a while as it tends to be reluctant to dissolve. 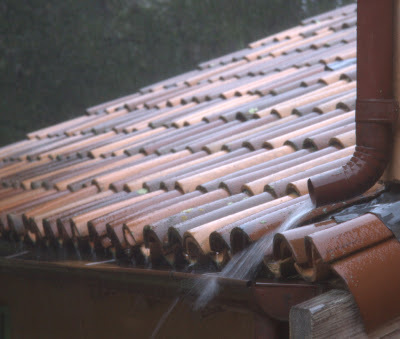 Rewarm the water and syrup mixture if necessary to bring it up to about 105F. Stir the yeast into the water and let it stand until foamy. Meanwhile, combine the flours and salt in the bowl of a stand mixer fitted with a dough hook. When the yeast mixture has foamed up a bit, add it to the flour mixture along with the olive oil. 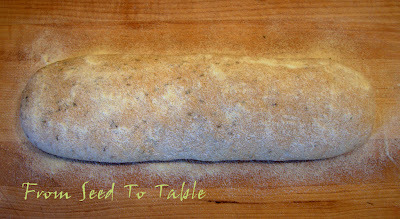 Mix until the dough comes together and knead on low speed for a few minutes, working in the fennel seeds towards the end. Turn the dough out and knead briefly by hand on a lightly floured surface. Pat the dough into a 14 X 4-inch rectangle and set it on a surface that has been lightly dusted with semolina flour. Cover with plastic wrap and let rise at room temperature for 1 hour. Preheat the oven to 450F about 15 minutes or more before the dough is done rising. Position one rack in the upper third of the oven and another rack in the lower third. Sprinkle the risen dough with semolina flour. Cut the dough crosswise (the short way) into 1/2-inch wide strips, or a bit thicker for the end pieces if the ends of the rectangle are rounded. You should have about 22 strips. Use 2 rimless 13.5 X 15-inch baking sheets, or you can turn 2 rimmed baking sheets of a similar size upside down. I like to roll each strip through the semolina flour on the work surface to lightly coat the cut sides. 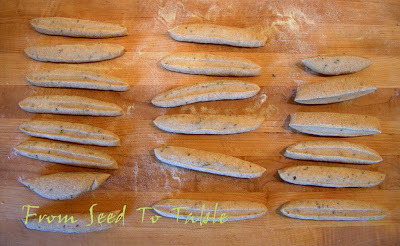 Pick up one strip and holding each end of the strip in with your fingers, pull and stretch the piece of dough to fit the baking pan crosswise. Continue with the rest of the dough strips until both pans are filled with the strips of dough. The strips may shrink a bit, just stretch them a bit more as they lay on the pan, so that they fit from one edge of the pan to the other. No need to let the sticks rise a second time, put them in the preheated oven and immediately turn the oven down to 400F. Bake for 10 minutes and then rotate the pans from the top rack to the bottom rack and vice versa. Bake another 10 minutes. At this point I like to turn the oven off, open the door, but leave the bread sticks in the oven for about 30 minutes. This makes them extra crispy, the way I like them. But you may prefer to just take them out and let them cool on the pans on a cooling rack. The sage flavored bread sticks were the same recipe, except I used 100 grams of regular whole wheat flour and 400 grams of unbleached all-purpose flour. 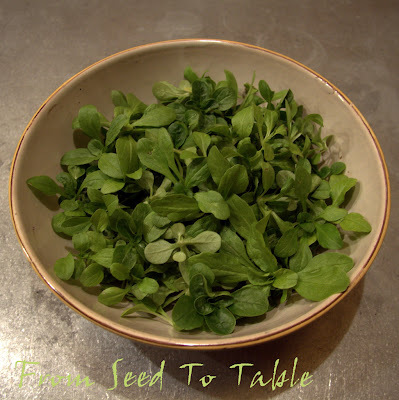 Substitute 1/4 cup chopped fresh sage for the fennel seeds. You can also make the recipe with all unbleached all-purpose flour, 500 grams (3 3/4 cups). 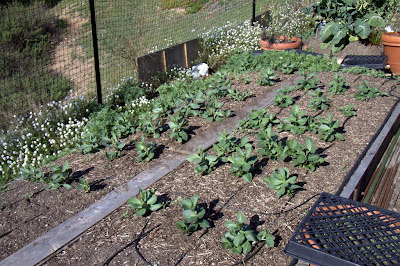 The favas that I sowed on November 10 are growing well. 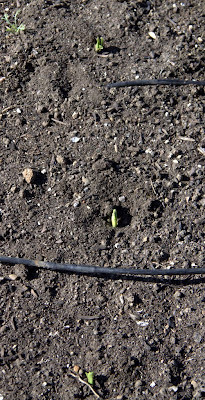 And the second sowing that went in on December 20 are just starting to emerge. That's it for that bed, just favas. 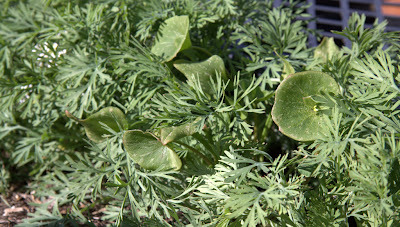 But, I have let a lot of California Poppies volunteer around the edges of the bed and there's also Miner's Lettuce volunteering in the bed also. 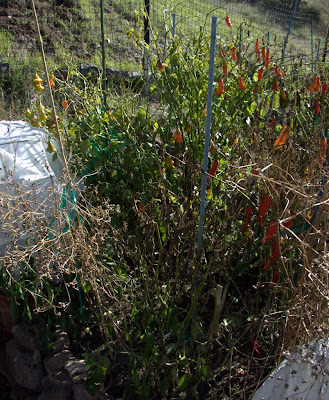 In the next bed, the Opal Creek Golden Snap Peas seem to be barely fazed by winter. The birds have done more damage than the frost. All the leaves at the tops of the plants have been pecked away. 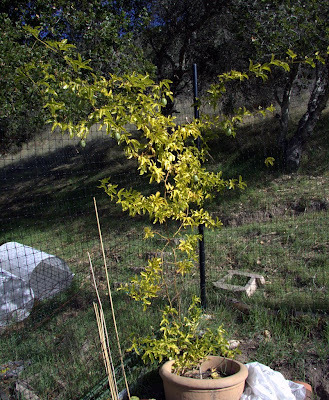 But there are lots of new shoots and flower buds lower on the plants. 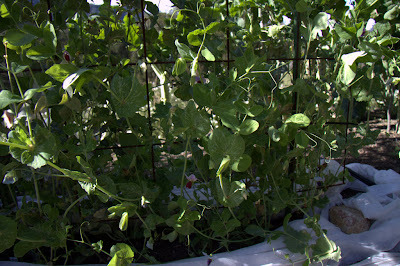 The Kefe Beinwil Snow Peas are also putting out a lot of growth lower on the plants. You can't really see them in the photo below, but the plants are starting to bloom again. 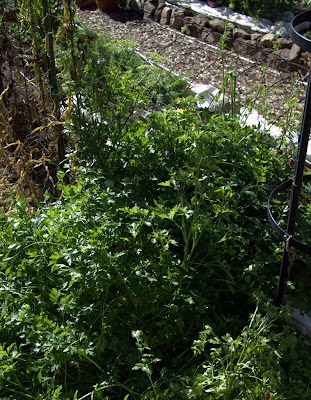 The kale plants are looking like small trees and the chervil is filling in the space below. 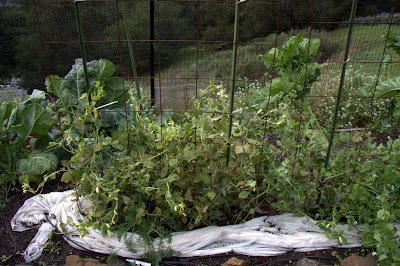 The kales and the peas all have powdery mildew so I treated them all this afternoon with some Neem oil. There's one Romanesco broccoli plant that is getting to be a half decent size. I had such problems getting the Romanesco started, it'll be a minor miracle if I get one decent head. My plants were huge by this time last year, this one is a dwarf in comparison. 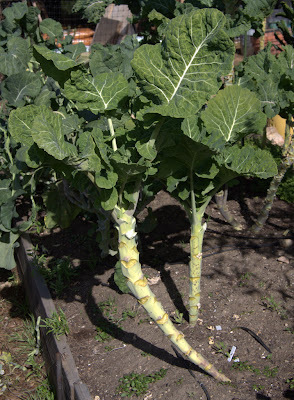 Here's a new kale that I'm trying, Smooth Leaf Kale from Portugal. The leaves are a bit mottled, I don't think that's normal, but it's still good tasting. 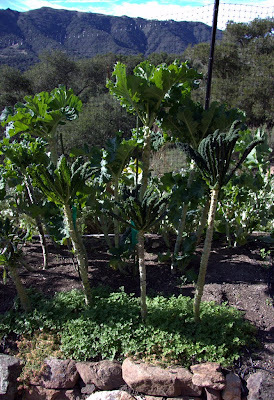 The aphids love it more than any other brassica in the garden. I wonder if the aphids transmitted some kind of virus to the plants? 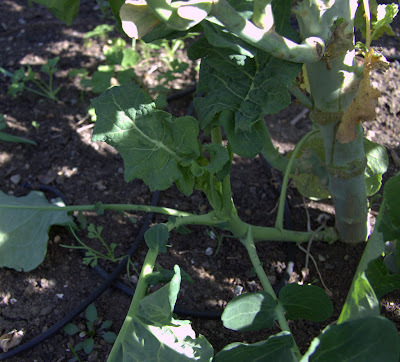 The Piracicaba broccoli continues to put out new shoots. 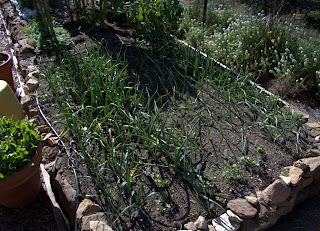 All the garlic has sprouted and is growing well. The silverskin varieties took much longer to sprout and aren't as big yet. 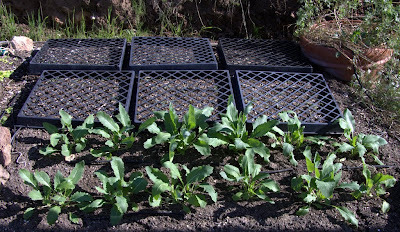 I have a few pots lining the main path with various salad greens. 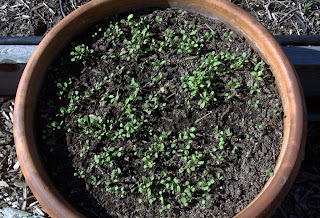 Olive Leaf Arugula, just emerging. 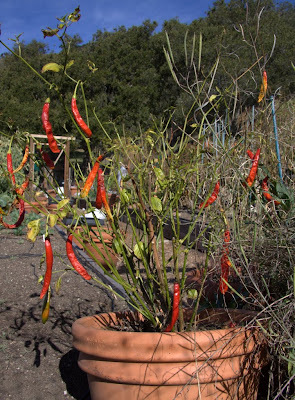 And there are a few potted pepper plants that are hanging around, these were all planted in spring of 2008. Aleppo, doing better than it looks here. 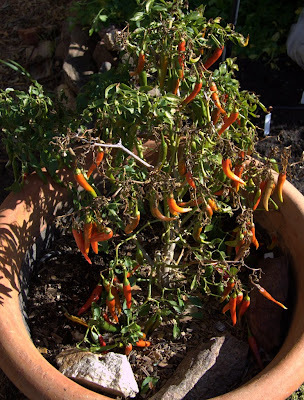 Aji Argentina, nearly leafless, but still with us. Aji Pineapple, this one got the most protection. 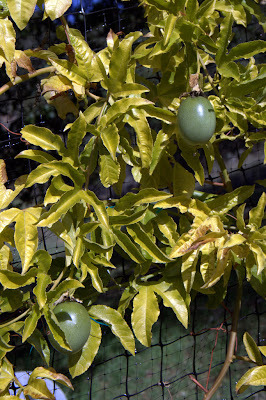 The Frederick passion fruit is looking a bit yellow but hasn't dropped its leaves. It still has some fruit but I don't know if these will be any good. 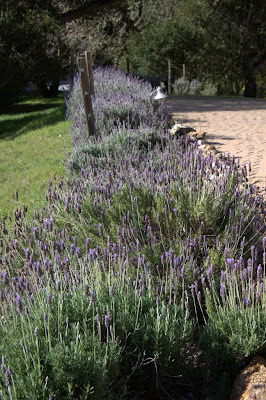 Not in the vegetable garden, but putting on a good show, the lavender lining the driveway is putting on a good show. 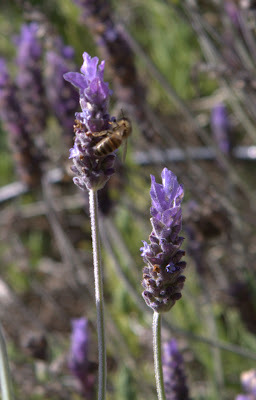 And the bees are loving it! 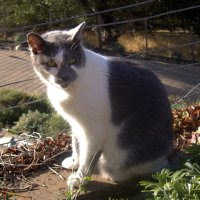 It's time for another survey of the vegetable garden. 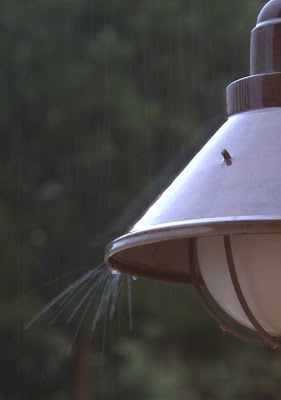 We've been enjoying some wonderful spring-like weather the last few days. The daytime temps have been around 70F, but partly cloudy. It almost makes me feel guilty to say that, knowing what unusually frigid weather much of the rest of the country is enduring. Have hope, spring will come! The experimental potato patch is doing better than expected. 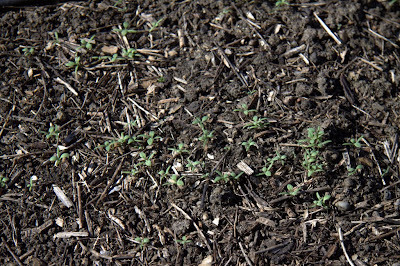 Some of the very first shoots got a bit frost nipped but they have recovered nicely. 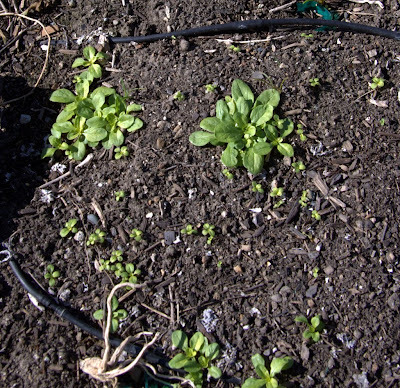 The carrot patch is next to the potatoes. It's a pretty scraggly bunch this winter. 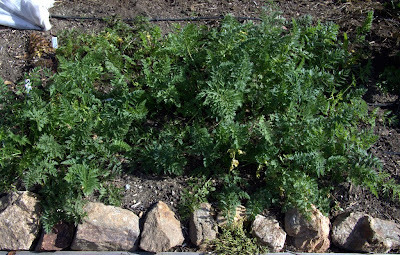 Lots of stubby carrots, perhaps because of the mole that's been tunneling around in the area. And the celery root patch is next. I finally harvested one good sized celery root last week. A look at the tag indicates that I sowed the seeds last February! There's one more nice sized one ready to harvest. 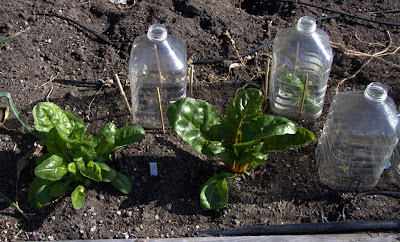 The Golden Chard seemed to appreciate the water bottle cloches that I covered them with. 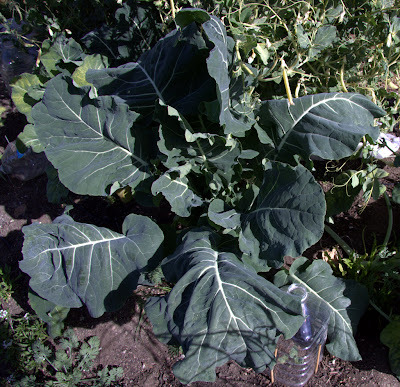 A couple plants are almost large enough to start harvesting a few leaves. I'm not sure if these will bolt this spring or not. 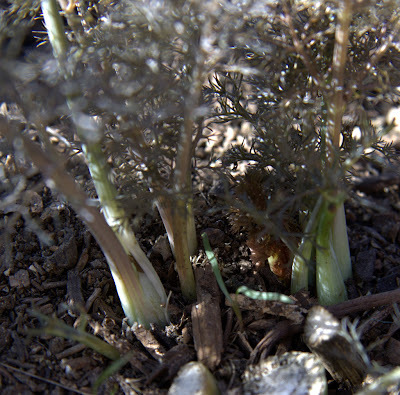 The Red Fennel is sending up new shoots from the bases of the plants. 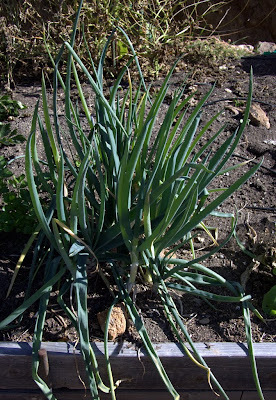 I harvested a lot of seeds from these plants and finally cut the stalks down just a few weeks ago when I noticed the new shoots. 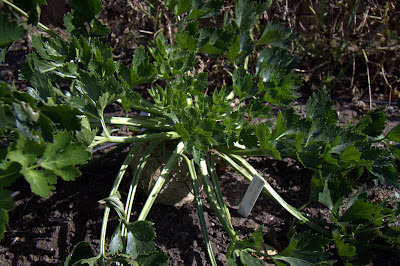 The shoots are supposed to form "bulbs" that are good to eat. Now that the amaranth is gone and the cutting celery is getting more light it's growing very nicely. 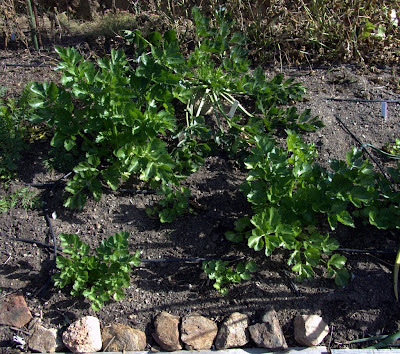 And, in another corner of this bed, the parsley is starting to bolt. There's still plenty of good leaves to harvest. 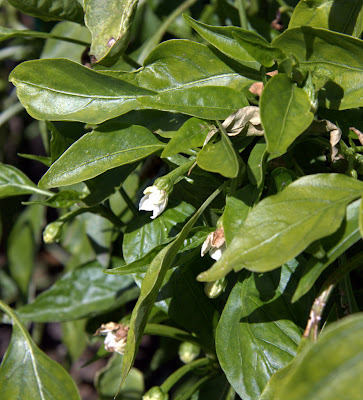 In the next bed, the peppers have seen better days, but not all of them are completely lost. 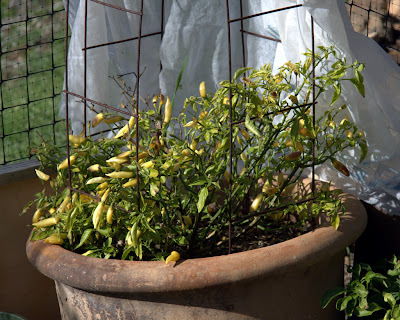 I'm hoping that the Pimento de Padron pepper plants will survive the winter. 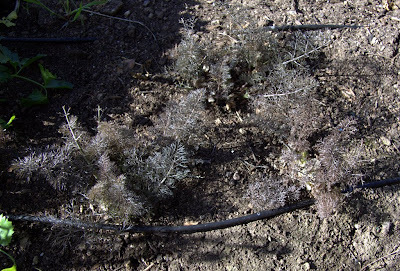 Some of the plants got zapped by the December frosts and freezes, but still have plenty of life lower in the plants. 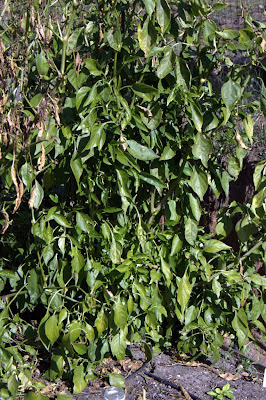 The Padron plants on the back side of the bed are in much better shape. And even have some blossoms. And even a few peppers! 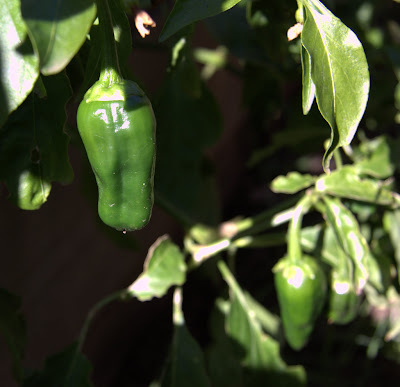 It sure would be nice to get a head start on the Pimento de Padron harvest this year. The beet patch is looking patchy. 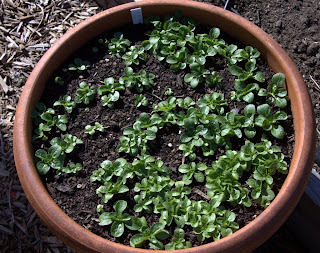 I managed to get some more Burpee's Goldens to germinate and have been rounding up the cloches to try to give them some TLC. 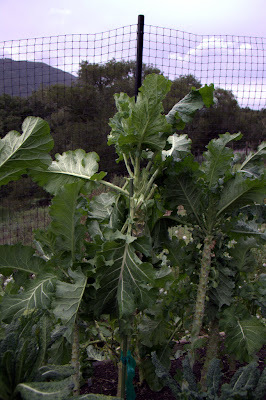 The Olive Leaf Rapini is coming along nicely. It needs a bit more thinning. 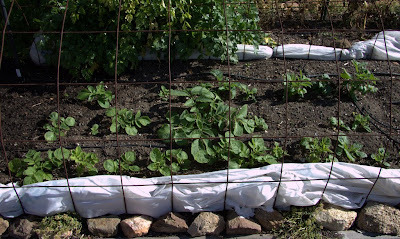 Last year I had to protect the plants from munching birds, but am not having those difficulties yet this year. Behind the rapini, under the bird protection flats, there are newly emerging seedlings of Monticello Poppies (thanks Christina!). 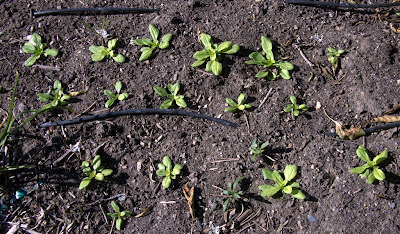 Golden Corn Salad seedlings are volunteering in this area. I've been digging them up, separating them, and replanting them with more space between the plants. They don't seem to mind the disturbance! That's it for the first two beds. I'll cover the other two beds in the next post.